A tale of two familiesJeju's peaceful, natural beauty is attracting families from far afield. 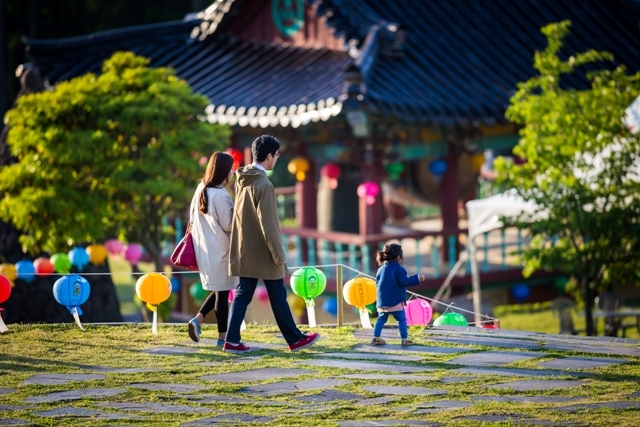 The month of May sees two important days for families in Korea - Children’s Day on May 5 and Parent’s Day on May 8. With this in mind, we set out to interview some of the families who have chosen to make Jeju their home. We interviewed the Barr family from the United States and the Liu family from China. I met with Jacob Barr one Thursday at Jeju National University where he is currently studying for a Ph.D. in Tourism Management. While conducting the interview we were sat outside on one of the nicest days of the year so far. The leaves on the trees were just beginning to sprout and Se Mi Oreum was in clear sight. Of course this quickly got us talking about the most obvious advantage to bringing up a child on Jeju - the natural environment. “Jeju is awesome, I like it. It definitely has a different feel to the mainland. There is a slower pace of life to the mainland and the weather is different. The environment is better,” Jacob stated. 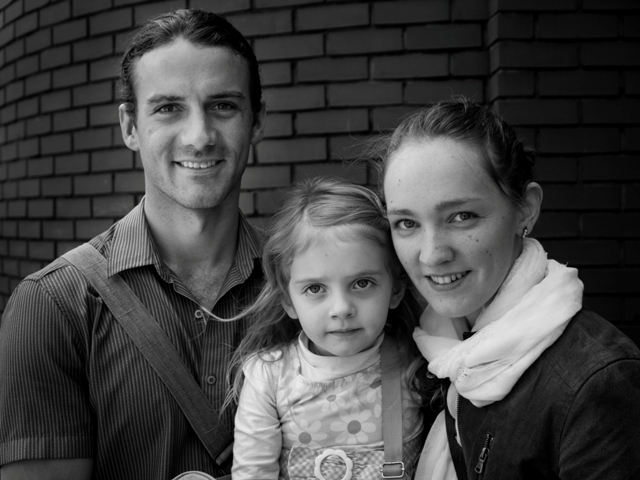 Jacob came to Jeju with his wife Candace, who is also studying at the university, and his five-year-old daughter Mila in August last year. Looking for a change from his US government job in Germany and after spending time in Changwon as Hagwon teachers in 2010, it was an easy choice to return to Korea and make the move to Jeju. “We had such a great year that it wasn’t a hard decision to come back to Korea. Leaving the government job to move to here seemed like a good decision,” he said. While the family’s prior experience of living abroad helped them settle in, moving to Jeju with a child still didn’t come without its difficulties, especially when it came to finding a preschool for Mila. “Getting her settled once we finally arrived in Jeju (was difficult). Finding a preschool for her was tricky because she was too young to go to kindergarten.” said Jacob. Jacob said being enrolled at school here was both a help and a hindrance when it came to settling down. Luckily, the Barr’s flexible schedule meant that in the first semester while they were unable to get Mila enrolled in a preschool, they could still look after her. “We had to take turns, one person would go to class, one person would watch her,” Jacob said. But when that wasn’t an option the couple had to think of other ways of looking after Mila. “Sometimes she actually went to class with us - that was cool,” said Jacob. Luckily though the child-care problem was soon solved and Mila is now enrolled in Kindergarten. The number of people moving to Jeju has been well noted. One of the larger demographics of people to move here are families looking to take advantage of Jeju’s way of life and natural beauty. Jacob certainly agrees that there are benefits to island life compared to the mainland. “Jeju would be better for a family than mainland Korea. It is more open, it doesn’t have urban sprawl like other cities in Korea do, we have more time to be outside,” he said. He also sees the benefits the flexibility of studying or teaching brings when it comes to being able to spend time with the family. He says they make the most of the natural beauty Jeju has to offer and they like to spend as much time as possible hiking and visiting Jeju’s many beaches. All in all, Jacob and family seem to be having a great time here on Jeju, although after living in many different places over the last 12 years they already have one eye on the next step. Jeju is becoming known as a romantic island. Nowhere is this truer than in Yoosuam, a peaceful and historic village in Aewol. Yoosuam is situated 15km southwest of Jeju International Airport and soars around 200-250m above sea level on Nokgomui Oreum. The village has been clearly blessed by mother nature and is surrounded by lush green trees and colourful plants. For the last few years, many immigrants and migrants have made this area their home. Included in these people are a number of artists, social activists, environmentalists and of course coffee shop and restaurant owners who come from all over to live together in harmony. It is in this picturesque and peaceful location that we held an interview with the Liu family from Shanghai. We met in their tea house called Shanghai Salon. Outside is a beautiful garden while the inside is filled with wooden tables and surrounded by books. The bookshelves are filled with many Chinese classics, seemingly like a mini library. Along with these wooden tables and bookshelves are pieces of art from the period of the Republic of China. This gives the tea house a unique atmosphere. The owner gave me a flower tea that is proving to be popular amongst the cafe’s female customers. It was simultaneously both fragrant and sweet. 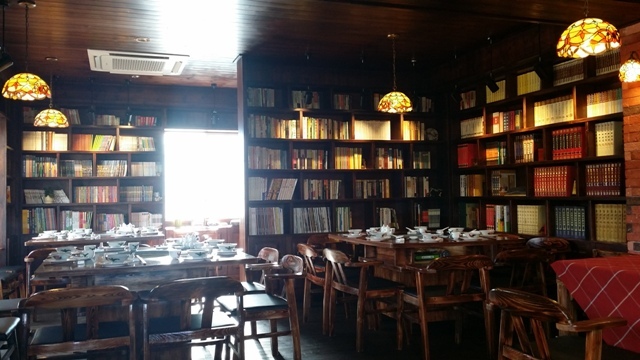 We then sat and spoke with the owners about why they chose to settle down in Jeju. Two years earlier, with the education of their two elementary school-aged children on their minds, the family were deciding where to relocate. After ruling out Europe and other western countries, they decided to settle down in Jeju. It then wasn’t long before they decided to buy and remodel a villa in Yoosuam to make their own special place. Going down this path has helped them to lead a peaceful life. The husband said he feels like he has managed to achieve his dream of a tranquil and genuine life. As a restaurant, teahouse and a book cafe, Shanghai Salon hopes to become a place where people can come to talk and relax in a good atmosphere. The restaurant has only been open for around one month but it is already becoming a popular hangout spot amongst Chinese residents of Jeju. Here friends meet in reading clubs and other small groups and enjoy the cafe. Of course, it isn’t only Chinese people that come to enjoy the cafe. Koreans who want to interact with Chinese people are also becoming regulars. The owners hope that in the future it will become a place where people can relax together and enjoy their time.